These Black Herringbone Wool Trousers are being sold from our Ex-Hire stock. This item will have been hired out and dry cleaned no more that 3 times, so it is still in good condition. Due to seasonal changes we periodically sell off some of our existing hire clothes at a reduced price to make way for new items coming into our warehouse. 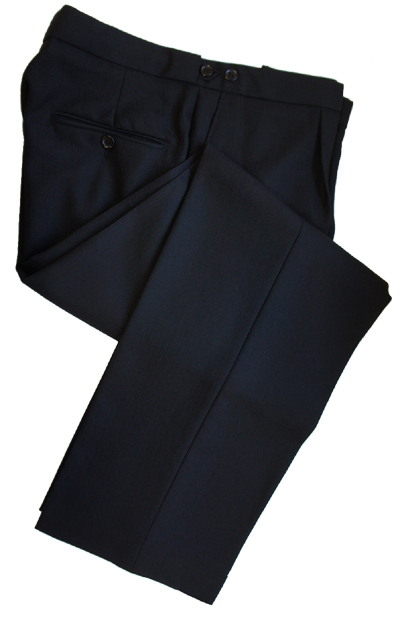 These trousers are manufactured from a medium weight, traditional 100% wool black herringbone cloth. This cloth matches the fabric we use for our herringbone masonic jackets, morning coats, waistcoats and Prince Edward Coats. They come finished with single pleates and side adjusters on the waist for taking in approx one inch if required. Please refer to our sizing guide for more info on measurements and sizes. Trouser Size: Please SelectWaist 28" Inside Leg 30"Waist 30" Inside Leg 30"Waist 30" Inside Leg 32"Waist 32" Inside Leg 30"Waist 32" Inside Leg 32"Waist 32" Inside Leg 34"Waist 34" Inside Leg 28"Waist 34" Inside Leg 32"Waist 34" Inside Leg 34"Waist 36" Inside Leg 30"Waist 36" Inside Leg 28"Waist 36" Inside Leg 34"Waist 38 Inside Leg 28"Waist 38" Inside Leg 34"Waist 40" Inside Leg 28"Waist 40" Inside Leg 30"Waist 46" Inside Leg 30"Waist 48" Inside Leg 30"Waist 28" Inside Leg 32"Waist 28" Inside Leg 34"Waist 30" Inside Leg 34"Waist 34" Inside Leg 30"Waist 36" Inside Leg 32"Waist 38" Inside Leg 30"Waist 42" Inside Leg 30"Waist 42" Inside Leg 32"Waist 44" Inside Leg 30"Waist 46" Inside Leg 32"Waist 48" Inside Leg 34"Waist 50" Inside Leg 30"
I placed an order with you with you last Friday and it arriv ..